Where is India Inc.’s CSR money coming from? We have plotted average annual CSR spend for all companies spending more than a crore annually on CSR in India. Each dot on the graph represents a company. Companies are sorted region-wise and appear in the order of their year on incorporation (on X axis). We find that out of 24,000 companies in our data-set, only 1,258 (About 5%) companies are above 1-crore annual CSR spend threshold. Together, these 5% companies generate a total of INR 24,697 crore (88.4%) out of the entire INR 27,950 crore CSR corpus in India. At a regional level, the highest concentration of these companies is in the West, North and South region (1158 out of 1258 or 92.1%). In these three regions, average annual CSR fund per company is the highest for North region (INR 7.6 crore) followed the West region (INR 6.6 crore). In contrast, companies in North East and Central region generate a much higher CSR fund on a per-company annual average basis. 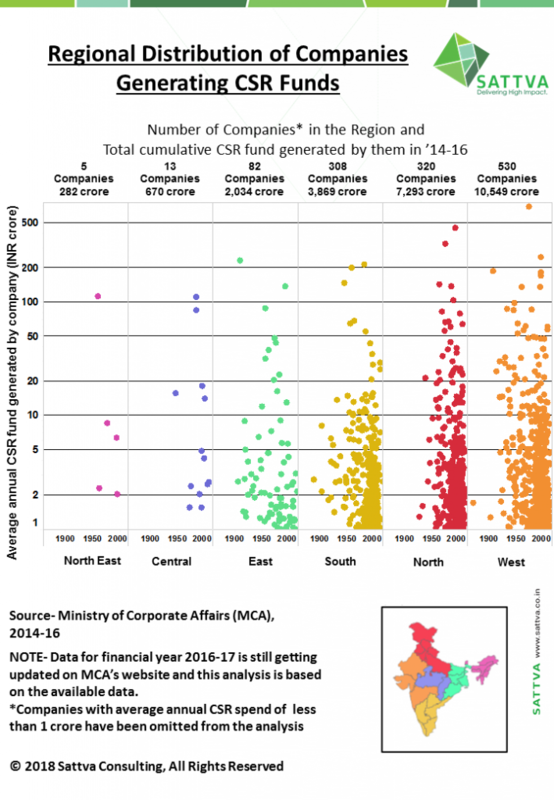 While the All India average for this parameter is INR 6.5 crore per company per year, the same for North East and Central region is INR 18.8 crore and INR 17.2 crore respectively. Fewer and bigger companies Vs high concentration of smaller companies – what’s working well for CSR in each region? Stay tuned as we bring more insights on this. Meanwhile, do share/comment/like and help more of your network think through this!